What Is the Definition of Pneumonia? What Causes the Various Types of Pneumonia? Is Pneumonia Contagious, and How Does It Spread? What Are Pneumonia Symptoms and Signs in Adults and Children? What Tests to Health-Care Professionals Use to Diagnose Pneumonia? What Are Treatments for Pneumonia? What Is the Prognosis for Pneumonia? Are There Vaccines for Pneumonia? What Are Potential Pneumonia Vaccine Side Effects? Pneumonia is a lung infection that can be caused by different types of microorganisms, including bacteria, viruses, fungi, and parasites. Children and babies who develop pneumonia often do not have any specific signs of a chest infection but develop a fever, appear quite ill, and can become lethargic. Pneumonia is suspected when a doctor hears abnormal sounds in the chest, and the diagnosis is confirmed by a chest X-ray. Bacteria and fungi causing pneumonia can be identified by sputum culture. In some cases, detection of bacteria causing pneumonia can be done with urine tests (for example, Legionella, Pneumococcus). In others, blood tests demonstrate the body's immune response to certain infections. The results of these blood tests often identify the organism after the patient has recovered. A pleural effusion is a fluid collection around the inflamed lung. This often results when the pneumonia is close to the chest wall and causes inflammation in the pleurae surrounding the lung. Bacterial and fungal (but not viral) pneumonia can be treated with antibiotics and antifungal agents, respectively. Pneumonia is an infection of one or both lungs that is usually caused by bacteria, viruses, fungi, or parasites. There are many different manifestations of pneumonias based on the type of microbe causing it. In some cases, a microbe can cause different kinds of pneumonia. Sometimes pneumonia affects a portion of one lung, and in other cases, the infection is diffuse throughout both lungs. Some cases of pneumonia can develop associated fluid collections. Some causes, like Staphylococcus aureus, can be very destructive to lung tissue. Prior to the discovery of antibiotics, one-third of all people who developed pneumonia subsequently died from the infection. Currently, over 3 million people develop pneumonia each year in the United States. Over a half a million of these people are admitted to a hospital for treatment. Although most of these people recover, approximately 5% will die from pneumonia. Pneumonia is the sixth leading cause of death in the United States. Klebsiella pneumoniae and Hemophilus influenzae are bacteria that often cause pneumonia in people suffering from chronic obstructive pulmonary disease (COPD) or alcoholism. Mycoplasma pneumoniae is a type of bacteria that often causes a slowly developing infection. Symptoms include fever, chills, muscle aches, diarrhea, and rash. This bacterium is the principal cause of many pneumonias in the summer and fall months, and the condition often referred to as "atypical pneumonia." Legionnaire's disease is caused by the bacterium Legionella pneumoniae that is most often found in contaminated water supplies and air conditioners. It is a potentially fatal infection if not accurately diagnosed. Pneumonia is part of the overall infection, and symptoms include high fever, a relatively slow heart rate, diarrhea, nausea, vomiting, and chest pain. Older men, smokers, and people whose immune systems are suppressed are at higher risk of developing Legionnaire's disease. Mycoplasma, Legionnaire's, and another infection, Chlamydia pneumoniae, all cause a syndrome known as "atypical pneumonia." In this syndrome, the chest X-ray shows diffuse abnormalities, yet the patient does not appear severely ill. In the past, this condition was referred to as "walking pneumonia," a term that is rarely used today. These infections are very difficult to distinguish clinically and often require laboratory evidence for confirmation. Pneumocystis jiroveci (formerly known as Pneumocystis carinii) pneumonia is another form of pneumonia that usually involves both lungs. It is seen in patients with a compromised immune system, either from chemotherapy for cancer, HIV/AIDS, and those treated with TNF (tumor necrosis factor), such as for rheumatoid arthritis. Viral pneumonias can be caused by adenovirus, rhinovirus, influenza virus (flu), respiratory syncytial virus (RSV), and parainfluenza virus (that also causes croup). Fungal infections that can lead to pneumonia include histoplasmosis, coccidiomycosis, blastomycosis, aspergillosis, and cryptococcosis. These are responsible for a relatively small percentage of pneumonias in the United States. Since there are many kinds of organisms causing pneumonia, the way in which they are transmitted and how contagious they are varies according to the specific organism. Tuberculosis, Mycoplasma, and viral pneumonias can be more easily transmitted from person to person but may manifest in different ways once transmitted, sometimes more severe, and others less so. Some cases of pneumonia are contracted by breathing in small droplets that contain the organisms that can cause pneumonia. These droplets get into the air when a person infected with these germs coughs or sneezes. The person infected by these organisms may develop pneumonia but may not. Many factors may play a role, such as the immune status of the infected person and the volume or extent of organisms in the exposure. In other cases, pneumonia is caused when bacteria or viruses that are normally present in the mouth, throat, or nose inadvertently enter the lung. Hence, these organisms are less likely to spread easily. It is possible, however, for someone to become contaminated with these organisms, say, in their mouths. At a later date, they may aspirate the bacteria into the lungs, and if conditions are right they may develop pneumonia. Some organisms can contaminate an object and may contaminate their hands if picked up by another. Later, if that individual touches their mouth, they may contaminate their saliva. These objects that the organisms contaminate are referred to as fomites. This explains why so many health professionals advise frequent hand-washing, especially around patients with pneumonia. One organism has become incredibly prominent throughout the United States by this form of contamination. It is called MRSA or methicillin-resistant Staphylococcus aureus. Staph aureus can cause very damaging forms of pneumonia, not to mention infections of other parts of the body. Since it is resistant to methicillin, it often requires more advanced types of antibiotics, many times given intravenously. During sleep, it is quite common for people to aspirate secretions from the mouth, throat, or nose. Normally, the body's reflex response (coughing back up the secretions) and their immune system will prevent the aspirated organisms from causing pneumonia. However, if a person is in a weakened condition from another illness, a severe pneumonia can develop. 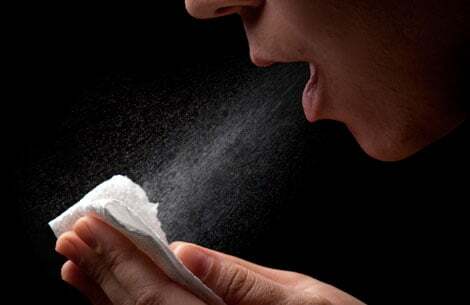 People with recent viral infections, lung disease, heart disease, and swallowing problems, as well as alcoholics, drug users, and those who have suffered a stroke or seizure are at higher risk for developing pneumonia than the general population. As we age, our swallowing mechanism can become impaired as does our immune system. These factors, along with some of the negative side effects of medications, increase the risk for pneumonia in the elderly. Once organisms enter the lungs, they usually settle in the air sacs and passages of the lung where they rapidly grow in number. This area of the lung then becomes filled with fluid and pus (the body's inflammatory cells) as the body attempts to fight off the infection. Some organisms, like the Mycobacterium that causes tuberculosis, may take weeks of therapy before the infected individual is no longer contagious. This period can go on for some time if therapy is not taken appropriately. In some instances, therapy is observed by physicians to confirm that the proper amount and duration of therapy has been completed. Other organism like Mycoplasma may only be contagious for a few days to a week. Most people who develop pneumonia initially have symptoms of a cold (upper respiratory infection, for example, sneezing, sore throat, cough), which are then followed by a high fever (sometimes as high as 104 F), shaking chills, and a cough with sputum production. The sputum is usually discolored and sometimes bloody. Depending on the location of the infection, certain symptoms are more likely to develop. When the infection settles in the air passages, cough and sputum tend to predominate the symptoms. In some, the spongy tissue of the lungs that contain the air sacs is more involved. In this case, oxygenation of the blood can be impaired, along with stiffening of the lung, which results in shortness of breath. At times, the individual's skin color may change and become dusky or purplish (a condition known as cyanosis) due to their blood being poorly oxygenated. The only pain fibers in the lung are on the surface of the lung, in the area known as the pleura. Chest pain may develop if the outer aspects of the lung close to the pleura are involved in the infection. This pain is usually sharp and worsens when taking a deep breath and is known as pleuritic pain or pleurisy. In other cases of pneumonia, depending on the causative organism, there can be a slow onset of symptoms. A worsening cough, headaches, and muscle aches may be the only symptoms. Children and babies who develop pneumonia often do not have any specific signs of a chest infection but develop a fever, appear quite ill, and can become lethargic. Elderly people may also have few of the characteristic symptoms with pneumonia. Pneumonia may be suspected when the doctor examines the patient and hears coarse breathing or crackling sounds when listening to a portion of the chest with a stethoscope. There may be wheezing or the sounds of breathing may be faint in a particular area of the chest. A chest X-ray is usually ordered to confirm the diagnosis of pneumonia. The lungs have several segments referred to as lobes, usually two on the left and three on the right. When the pneumonia affects one of these lobes, it is often referred to as lobar pneumonia. Some pneumonias have a more patchy distribution that does not involve specific lobes. In the past, when both lungs were involved in the infection, the term "double pneumonia" was used. This term is rarely used today. Sputum samples can be collected and examined under the microscope. Pneumonia caused by bacteria or fungi can be detected by this examination. A sample of the sputum can be grown in special incubators (cultured), and the offending organism can be subsequently identified. It is important to understand that the sputum specimen must contain little saliva from the mouth and be delivered to the laboratory fairly quickly. Otherwise, overgrowth of noninfecting bacteria from the mouth may predominate. As we have used antibiotics in a broader uncontrolled fashion, more organisms are becoming resistant to the commonly used antibiotics. These types of cultures can help in directing more appropriate therapy. A blood test that measures white blood cell count (WBC) may be performed. An individual's white blood cell count can often give a hint as to the severity of the pneumonia and whether it is caused by bacteria or a virus. An increased number of neutrophils, one type of WBC, is seen in most bacterial infections, whereas an increase in lymphocytes, another type of WBC, is seen in viral infections, fungal infections, and some bacterial infections (like tuberculosis). Bronchoscopy is a procedure in which a thin, flexible, lighted viewing tube is inserted into the nose or mouth after a local anesthetic is administered. Using this device, the doctor can directly examine the breathing passages (trachea and bronchi). Simultaneously, samples of sputum or tissue from the infected part of the lung can be obtained. Sometimes, fluid collects in the pleural space around the lung as a result of the inflammation from pneumonia. This fluid is called a pleural effusion. If a significant amount of fluid develops, it can be removed in a procedure known as a thoracentesis. After numbing the skin with local anesthetic, a needle is inserted into the chest cavity and fluid can be withdrawn and examined under the microscope by a pathologist. Often ultrasound is used to prevent complications from this procedure. In some cases, this fluid can become severely inflamed (parapneumonic effusion) or infected (empyema) and may need to be removed by more aggressive surgical procedures. Today, most often, this involves surgery through a tube or thoracoscope. This is referred to as video-assisted thoracoscopic surgery or VATS. Antibiotics often used in the treatment of this type of pneumonia include penicillin, amoxicillin and clavulanic acid (Augmentin, Augmentin XR), and macrolide antibiotics, including erythromycin (E-Mycin, Eryc, Ery-Tab, PCE, Pediazole, Ilosone), azithromycin (Zithromax, Z-Max), and clarithromycin (Biaxin). Penicillin was formerly the antibiotic of choice in treating this infection. With the advent and widespread use of broader-spectrum antibiotics, significant drug resistance has developed. Penicillin may still be effective in treatment of pneumococcal pneumonia, but it should only be used after cultures of the bacteria confirm their sensitivity to this antibiotic. Useful antibiotics in this case are the second- and third-generation cephalosporins, amoxicillin and clavulanic acid, fluoroquinolones (levofloxacin [Levaquin], moxifloxacin-oral [Avelox], and sulfamethoxazole/trimethoprim [Bactrim, Septra]). Macrolides (such as erythromycin, clarithromycin, and azithromycin) and fluoroquinolones are antibiotics commonly prescribed to treat Mycoplasma pneumonia. Fluoroquinolones (see above) are the treatment of choice in this infection. This infection is often diagnosed by a special urine test looking for specific antibodies to the specific organism. Recently, a study performed in the Netherlands demonstrated that adding a steroid medication, dexamethasone (Decadron), to antibiotic therapy shortens the duration of hospitalization. This medication should be used with caution in patients whom are critically ill or already have a compromised immune system. Once diagnosed, it is treated with sulfa-containing antibiotics. Steroids are often additionally used in more severe cases. Viral pneumonias do not typically respond to antibiotic treatment. These pneumonias usually resolve over time with the body's immune system fighting off the infection. It is important to make sure that a bacterial pneumonia does not secondarily develop. If it does, then the bacterial pneumonia is treated with appropriate antibiotics. In some situations, antiviral therapy is helpful in treating these conditions. More recently, H1N1 flu, has been associated with very severe pneumonia often resulting in respiratory failure. This disease often requires the use of mechanical ventilation for breathing support. Death is not uncommon when this infection involves the lungs. Hantavirus has been in the news recently after several individuals became infected at Camp Curry in Yosemite National Park. This virus grows in the excrement found in rodents' nests, especially mice. Apparently, replacing old tent cabins with more modern dual layer canvas allowed a perfect space for mice to nest. This infection can spread to the lungs and cause a condition known as hantavirus pulmonary syndrome (similar to ARDS, acute respiratory distress syndrome), which in this case is often fatal. Treatment involves primary support of the patient as the body tries to heal itself. Each fungus has specific antibiotic treatments, among which are amphotericin B, fluconazole (Diflucan), penicillin, and sulfonamides. Major concerns have developed in the medical community regarding the overuse of antibiotics. Most sore throats and upper respiratory infections are caused by viruses rather than bacteria. Though antibiotics are ineffective against viruses, they are often prescribed. This excessive use has resulted in a variety of bacteria that have become resistant to many antibiotics. These resistant organisms are commonly seen in hospitals and nursing homes. In fact, physicians must consider the location when prescribing antibiotics (community-acquired pneumonia, or CAP, versus hospital-acquired pneumonia, or HAP). The more virulent organisms often come from the health-care environment, either the hospital or nursing homes. These organisms have been exposed to a variety of the strongest antibiotics that we have available. They tend to develop resistance to some of these antibiotics. These organisms are referred to as nosocomial bacteria and can cause what is known as nosocomial pneumonia when the lungs become infected. Recently, one of these resistant organisms from the hospital has become quite common in the community. In some communities, up to 50% of Staph aureus infections are due to organisms resistant to the antibiotic methicillin. This organism is referred to as MRSA (methicillin-resistant Staph aureus) and requires special antibiotics when it causes infection. It can cause pneumonia but also frequently causes skin infections. In many hospitals, patients with this infection are placed in contact isolation. Their visitors are often asked to wear gloves, masks, and gowns. This is done to help prevent the spread of these bacteria to other surfaces where they can inadvertently contaminate whatever touches that surface. It is therefore very important to wash hands thoroughly and frequently to limit further spread of this resistant organism. The situation with MRSA continues to evolve. The community-acquired strain of MRSA tends to be responsive to some of the more commonly used antibiotics whereas the hospital-acquired strains require stronger, more aggressive antibiotic therapies. As this evolution occurs, patients are arriving in the hospital with the community-acquired strains as well as a previous hospital-acquired strain. This further necessitates performing bacterial cultures to determine the best course of action. Pneumonia can be a serious and life-threatening infection. This is true especially in the elderly, children, and those who have other serious medical problems, such as COPD, heart disease, diabetes, and certain cancers. Fortunately, with the discovery of many potent antibiotics, most cases of pneumonia can be successfully treated. In fact, pneumonia can usually be treated with oral antibiotics without the need for hospitalization. Many different specialists treat pneumonia, most commonly primary-care physicians, including family practice, pediatrics, and internal-medicine specialists. If some of the more serious manifestations develop requiring hospitalization other specialists, like specialists in pulmonary medicine (pulmonologists) and infectious diseases may be involved in the patient's care. Two vaccines are available to prevent pneumococcal disease: the pneumococcal conjugate vaccine (PCV13) and the pneumococcal polysaccharide vaccine (PPV23; Pneumovax). The pneumococcal conjugate vaccine is part of the routine infant immunization schedule in the U.S. and is recommended for all children < 2 years of age and children 2-4 years of age who have certain medical conditions. This vaccine is now also recommended for children and adults up to the age of 64 years with certain health issues, like chronic lung disease and diabetes. It is also recommended for all adults 65 and over. It does not require a booster shot. The pneumococcal polysaccharide vaccine is recommended for adults at increased risk for developing pneumococcal pneumonia including the elderly, people who have diabetes, chronic heart, lung, or kidney disease, those with alcoholism, cigarette smokers, and in those people who have had their spleen removed. Some people may need a repeat vaccination after five years. Usually vaccines only result in very minor local injection site reactions. Some people develop a mild flu-like syndrome with low-grade fever, malaise, headache, and muscle aches. In extremely rare cases, some may develop the neurologic syndrome known as Guillain-Barré syndrome. This can cause numbness and weakness in the extremities, resolving spontaneously in most cases. Some of those affected require treatment, and others can have significant neurologic impairment. Despite the frightening sound of these side effects, the risks of dying from pneumonia are far greater than the risks of contracting this rare side effect of the vaccine. There is no good data supporting the development of autism in children taking this vaccine. Anyone who has had a severe allergic reaction to prior PCV (PCV7) or diphtheria vaccine should not receive this vaccine. Hoare, Zara, and Wei Shen Lim. "Pneumonia: Update on Diagnosis and Management." BMJ 332 May 6, 2006: 1077-1079. Meijvis, Sabine CA, et al. "Dexamethasone and Length of Hospital Stay in Patients With Community-Acquired Pneumonia: A Randomised, Double-Blind, Placebo-Controlled Trial." The Lancet. June 1, 2011. doi:10.1016/S0140-6736(11)60607-7. Taylor, L.E., et al. "Vaccines are not associated with autism: An evidence-based meta-analysis of case-control and cohort studies." Vaccine 32.29 June 17, 2014: 3623-3629. United States. Centers for Disease Control and Prevention. "Outbreak of Hantavirus Infection in Yosemite National Park." Sept. 17, 2012. <http://www.cdc.gov/hantavirus/outbreaks/yosemite-national-park-2012.html>. United States. Centers for Disease Control and Prevention. "Seasonal Influenza (Flu)." June 3, 2011. <http://www.cdc.gov/flu/weekly/>. Please describe your experience with pneumonia. Please describe your pneumonia symptoms. What kinds of tests or exams led to a diagnosis of pneumonia in you, a friend, or relative? What kinds of treatment have been effective for your pneumonia? What was the progression and prognosis of pneumonia for you, a relative, or friend?